A Pacer will be auctioned on June 11th 2003 at 15 O'clock by the Hôtel des ventes at the Roche Sur Yon with a beginning price of 2300 EURO. It's a 6 cylinder in line, fiscal power of 22 CV, 4235 ccm/ 258ci, 1st day of circulation 04/December/1975, 65000 Km, Automatic trans. on the floor, CG Collection, blue metallic, inside bleu, Good condition in general, Technical Control OK. I gave this information as I discovered your website and may be somebody could be interested. A 77 Pacer 6 cyl ( 258ci /4235 ccm) green, inside tobacco, CG, normal with AC and auto trans on the floor. original 60 000 km . Said to be Rust free for 35'000FF (abot 6'000€) negotiable. Tel +33 4 92 20 35 08. AMC PACER LIMITED V8 all options RESTORED, see magazine Rétro-Passion n°101 and photos that the owner sended me! 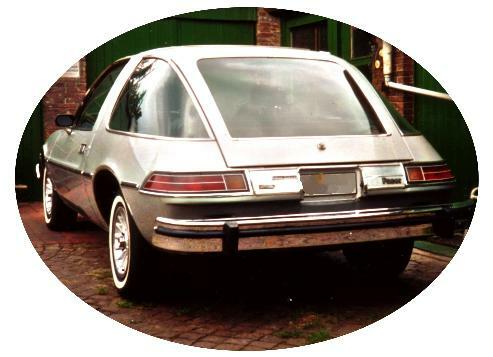 AMC Pacer silver edition 5.9 V8 ! Sylvio has also a lot of spare parts too! He speaks either French or German, call him if you want at +41 32 913 32 79 or you can get in touch thru me! Pacer V8 Coupe, fully loaded (AC/PS...), vin°: A9C 667 H 152 463. First registration on 25.4.1979. Swiss control passed at Neuchâtel on 27.11.2001. ca. 105'000 kms, 4 winter wheels and tires (about 2500 kms driven), 4 Summer wheels and tires (about 5000 kms driven). About 15'000 FRS of restoration evidences. Very good condition. Click to Supersize the pictures.